Wheel of Light Roulette - Play for FREE at Lord Bingo NOW! Step 1 – The first thing you will want to do is place a bet on the Wheel of Light Roulette instant game. There are five different types of bets to choose from, so we thought we had better tell you a bit about them first of all. – Exact Number Bet – Allows you to bet on one of the 31 individual numbers that range between 0 and 30. – Number Spread Bet – Bet your chips on one of the following groups of numbers: 1-5, 6-13, 14-16, 17-23 or 24-30. – Colour Bet – Bet on the Wheel of Light Roulette ball falling in the green, orange, blue or red section of the wheel. 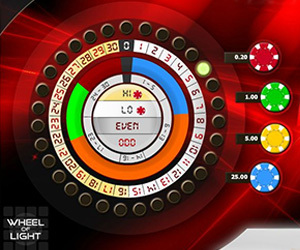 – Even/Odd Bet – Stake that the Wheel of Light Roulette instant game will land on an odd or even number. Step 2 – Once you are familiar with the different types of bets in this exciting instant game then you will be able to stake your money by selecting one of the four different coloured chips. The red chips are worth 10p, green chips 15p, yellow chips 20p and the blue chips are worth 25p. You can put down multiple chips on each spin of the Wheel of Light Roulette instant game and can even stake as much as £40 on each of the bet placement areas. To do this you have to repeatedly click on the same area. If you have made a mistake and want to remove a chip from a bet placement area, then simply press the ‘Shift' key and click on the area you want it removed from. If you want to remove all your bets, then simply click on the ‘Clear All' button. Step 3 – Once you are happy with your stake click on the massive circular button with a picture of a dropping ball and arrow on it and the light on wheel will start to spin. The game ends when the light stops on a number, if you are lucky enough to win anything, then it will come up on the screen. Online Roulette is another popular Keno game you can play for free on Lord Bingo. Wheel of Light Roulette is a fun action packed roulette style instant game that gives players multiple ways to walk away with a cash prize. The instant game is simple to play once you know the five different ways to place your bets; however if we had to make a minor criticism then we would like to see a simpler way to increase your bets. The current method means that if you want to bet the maximum amount of £40 on one bet placement, then it takes a fair while for you to get there. However if you are a roulette fan, then we would have to say that Wheel of Light Roulette is one of the most exciting instant games that we have seen.